And speaking of mines, peruse the work of photographer Fred Kruijen in the fourth installment of our occasional series FotogFocus. Below, detail of magnetite, with tiny bunches of aragonite, from Germany’s Eifel Mountains. The second annual edition of What’s Hot in Tucson – Gems & Jewelry was released earlier this summer by BlueCap Productions. Host Delphine Leblanc takes you on a two-hour tour of this members-only show—the AGTA GemFair—an exclusive opportunity you won’t receive anywhere else. Didn’t get the 2010 edition? BlueCap is offering this bundle at a reduced price. The following press release was issued by GIA (Gemological Institute of America) last Thursday, August 11. 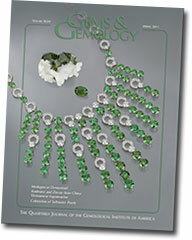 Visit the website for more information on this issue of Gems & Gemology. 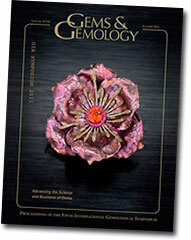 The Summer 2011 issue of Gems & Gemology (G&G), which is now available, features the proceedings of GIA’s 5th International Gemological Symposium, “Advancing the Science and Business of Gems.” The May 29–30 conference drew more than 730 participants from 35 countries. G&G’s Symposium recap starts with a summary of the opening keynote address by Steve Forbes, chairman of Forbes Media. Forbes examined the global economic climate and offered his essential principles of business leadership. In the Business track, industry leaders shared useful insights on luxury marketing, jewelry design, the auction and vintage market and ethical issues surrounding gemstone sourcing and sales. The Business sessions also featured a pair of keynote speakers from outside the industry: Scott Galloway discussed the strategic importance of social media in luxury marketing, while sustainability expert Dr. Brian Nattrass showed how his clients, including Starbucks and Nike, have adopted socially and environmentally responsible practices -- and profited from them. 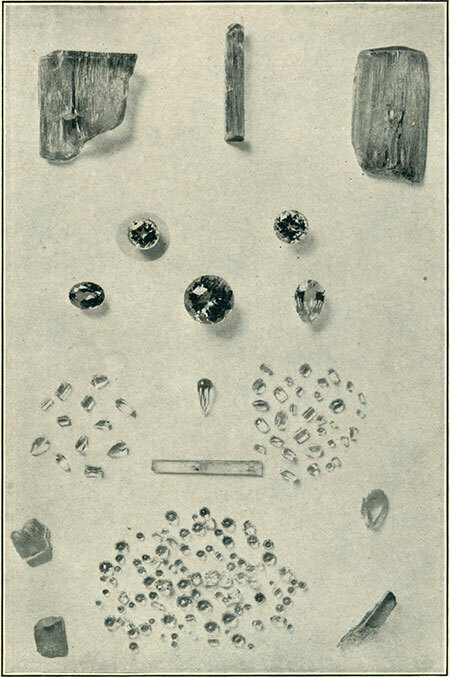 The Research track explored the science of gems, with more than two dozen presentations on diamond identification, gem deposits and exploration, the characterization of colored stones and advanced analytical techniques. The issue also contains abstracts of the 63 Poster Session presentations, Symposium’s interactive showcase of the latest scientific, technical and business research. The coverage also includes highlights from the Debate Center, where panelists and audience members engaged in a lively discussion of fair trade, ethical business practices, the problem of “conflict” diamonds and the effectiveness of economic sanctions. Complementing the reports are dozens of illustrations and photos of speakers, museum displays and social events. 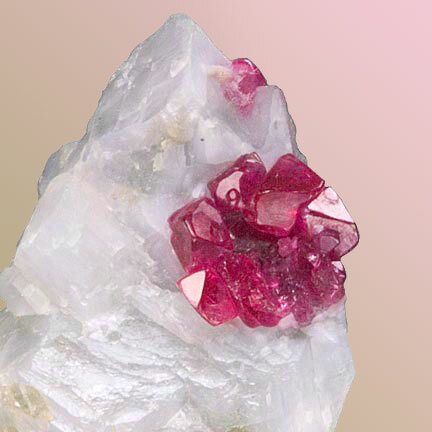 In addition to the Symposium proceedings, the Summer G&G issue includes a feature article on a controversial topic in the gem trade: the red gem feldspar known as andesine, reportedly mined in Tibet. As a companion to the 13-page featured article on andesine mentioned directly above, you’ll want to keep your temporal place using “Andesine: Timeline of a Controversy,” a PDF published by Richard W. Hughes on August 1. 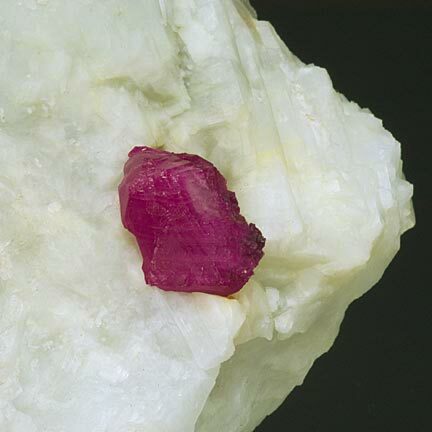 The timeline begins in 2001 with the successful treatment of pale feldspar, allegedly by a Chinese academic, into more valuable red material. Highlighted along the way are several trade shows whereby the red rocks were scrutinized. “Possibilities” are presented and “Questions” posed. The timeline is well illustrated and contains 45 references. This month we feature an unusual gem variety with a phenomenal property. Sillimanite, aka fibrolite, was named after Benjamin Silliman, a professor of chemistry and geology at Yale University, in 1824. Sillimanite is an aluminum silicate and is closely related to andalusite and kyanite. 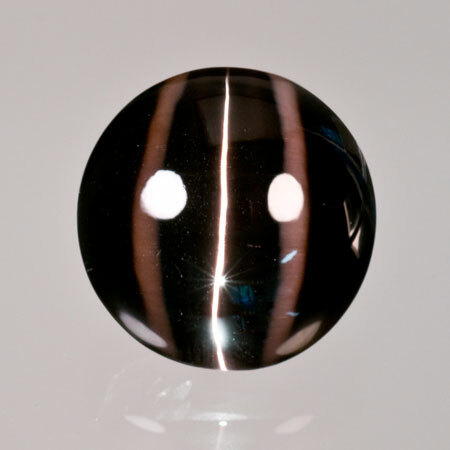 This cat’s eye sillimanite exhibits an exceptionally sharp white eye on a thick black base color. This contrast makes for a dramatic specimen. 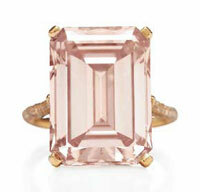 Weighing in at 63.15 carats, the piece also carries an impressive size in a perfectly round 22-millimeter diameter. This is a great gem for cat’s eye collectors or folks who just look to go big. Many forms of sillimanite are found around the globe, but the largest and finest cat’s eyes come from Orissa in India. For the past ten years, Pala International has engaged in a quest to obtain the Esmeralda Mine in Mesa Grande, California. Last Friday, Pala president Bill Larson told us, “Esmeralda is signed, sealed, and delivered. It closed escrow, leaving the California property tax collectors excited!” Pala plans to begin extension of work on the mine, which has lain dormant for decades. 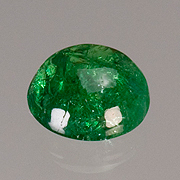 Esmeralda is the Spanish and Portuguese word for emerald. The mine may have been named for the “rich emerald green” tourmaline noted by George F. Kunz in a 1904 description, which we featured earlier this month in our sister e-newsletter, Pala Mineralis. We followed that with a 1957 description by Caltech’s R. H. Johns. John Sinkankas also wrote about the Esmeralda, which we include below. In our next edition of Pala Mineralis, in October, we will feature Sinkankas’s “Esmeralda Notes (Weekend 22–23 Sept 1956),” an unpublished manuscript. 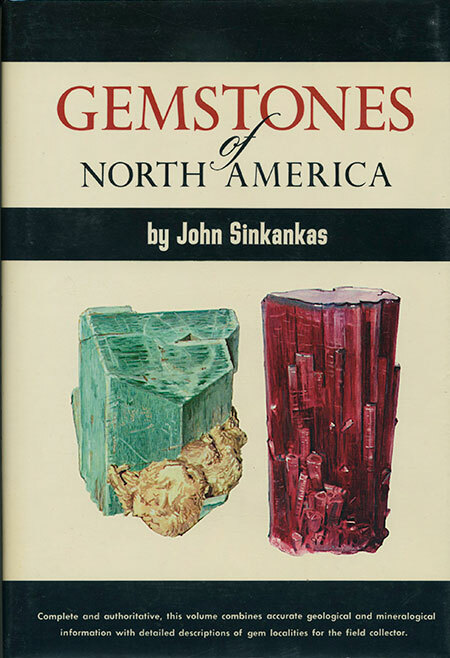 The following appears in Volume 1 of Gemstones of North America by John Sinkankas (Princeton: Van Nostrand, 1959). by Dr. Karl Schmetzer et al. In southern Zimbabwe, 20 km northeast of Masvingo (formerly known as Fort Victoria), lies the alexandrite deposit known as “Novello Claims,” the only commercial alexandrite-emerald deposit in the country. 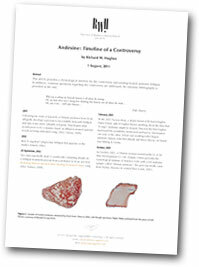 The April–June 2011 edition of Australian Gemmologist includes a study of the deposit by Dr. Schmetzer and his coauthors. The similarity of Novello alexandrite with that of the “classical” deposits in Russia’s Urals, created a stir in the 1960s and 1970s, due to alexandrite’s relative rarity, even though the Novello deposit produced mainly mineralogical specimens, and only few facetable pieces. Given the release last year of Dr. Schmetzer’s book, Russian Alexandrites, and relatively recent production by the Novello deposit, the article’s authors chose to compare the gemological properties of alexandrite from the two localities. Both sources occur in phlogopite matrix, but no such detailed comparison had been done. The 15-page study in Australian Gemmologist should fill this gap. 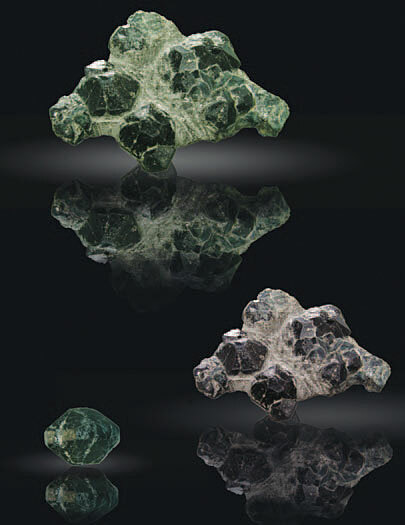 The article begins with a discussion of the geology of alexandrite and emerald, which at Novello are located in the same vicinity, but are not found together, with alexandrite occurring in phlogopite lenses within serpentinite at a further distance than the emerald from small, intrusive pegmatites. The formation of alexandrite at Novello and the regional geology of the Masvingo District also are covered. The morphology of alexandrite single crystals, twins and trillings is covered next, with Dr. Schmetzer inspecting 130 complete crystals and crystal groups along with fragments and crystals in matrix. Some crystal groups were so “intensely intergrown” that it was challenging to determine individual crystal faces. Such complexity often is ignored, when rough alexandrite is referred to as cyclic twins or trillings. The morphological properties are described in a series of tables, schematic crystal drawings and photographs. 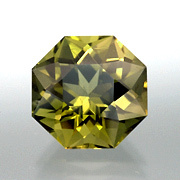 Faceted specimens were used for investigating some gemological properties, and compared with a 1967 study by Bank and Okrusch. Four ternary diagrams display trace element patterns in both Novello and Russian alexandrite, and demonstrate the application of such patterns for locality determination (although there is some overlap observed). 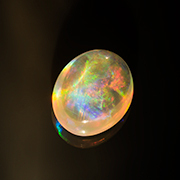 Aside from issues of relatively dark color in much of the Novello material, most larger gem-quality specimens (above 0.5 ct) also are heavily included and fractured, although their color-change property is distinctive. These characteristics, as well as color zoning, are covered in detail, followed by a summary of comparisons that neatly captures the major conclusions of the study. Three dozen references also are included. Visit Australian Gemmologist for the article abstract and information on how to subscribe or obtain back issues. We’re combining brief news items this month. The Hindu had several reports on Sree Padmanabhaswamy treasure, which we covered last month. First, we should note the passing of the man who started the investigation: T. P. Sundara Rajan died on July 17, as reported by The Hindu. He had been stricken with a fever for two days prior, according to relatives. A close family friend was quoted by India Today as saying that the strain of the last few weeks had taken a toll. 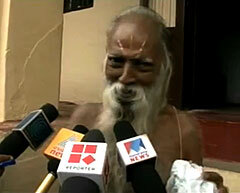 An NDTV report stated that just the week before, Sundara Rajan had been evicted from his office in a temple-owned building. A 43.51-carat internally flawless diamond, dubbed the “Golden Eye,” is on the auction block September 6, via online auctioneers Bid4Assets. With a length of 25.70 mm, the stone measures more than an inch. The stone was seized in a drug and money-laundering investigation by the feds, according to Associated Press. At one point the diamond was owned by Alliance, Ohio, businessman, Paul Monea, who was convicted in federal court of money laundering and conspiracy. Following the stone’s confiscation in a sting operation, several people claimed it for their own, but courts have ruled that the government could retain it—and sell it. 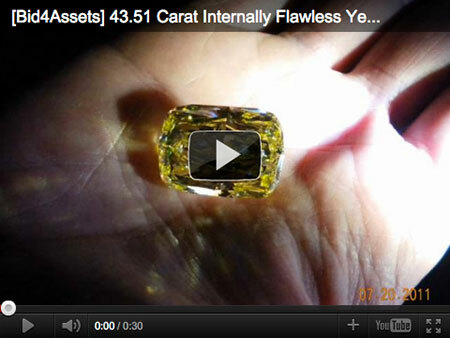 AP quotes GIA’s Tom Moses as stating that this type of larger yellow diamond often are produced in southern Africa. The Bid4Assets link above points to the GIA grading information. Myanmar Times (MT, July 18–24) ran a strange story regarding July’s Jade, Gems and Pearl Special Sales 2011, that is at odds with prior reports. As we noted in our July 14 edition, Reuters reported, that same day, that the sale had disappointed—with only €1.1 billion ($1.57 billion) in sales—according to a Federation of Chambers of Commerce and Industry official. The MT story, however, quotes an unnamed Myanmar Gems Enterprise spokesperson, with the following statistics, while declining to name a monetary total. As is correctly pointed out in the story, that’s 1500 lots more than sold last March at the “Annual” emporium. And three more pearl lots sold in July than even were offered in March. MT stated that the spokesperson claimed the sales figures “smashed those set at previous auctions.” If so, then the July figure would top the record of €2 billion, or $2.8 billion, set at the March 2011 emporium. That’s quite a discrepancy from the July 14 report. Myanmar Times bewilderingly reported the next week (July 25–31) that the total figures were the same as those given by Reuters. But the number of jade lots sold went up—by 2300. Even though the July 25 MT story claimed that a competing auction in China drew away potential customers from the Burma sale, Nay Pyi Taw hoteliers did very well for themselves, in some cases charging double their normal rates due to 100-percent booking, according to a July 18 MT story. Another 19 hotels are under construction, MT reported earlier. The first five months of 2011 saw a nearly 25-percent increase in tourist arrivals, MT reported July 11. An official marketing rep hopes for direct flights from Europe to Yangon. The Irrawaddy published three articles in recent weeks and months regarding jade and gem dealings large and small. On June 27, police had to protect five Chinese gem buyers from dozens of Burmese residents in Mandalay after a deal gone south. According to the article a local merchant had agreed to sell “a jade gemstone” to the Chinese for the equivalent of $5000, but when they returned to close the deal they were told it had been sold. It was alleged that the Chinese assaulted the merchant verbally and physically, then called the police. Locals, getting word of the altercation, gathered at the shop and sang the country’s national anthem, an indication of the resentment towards Chinese that lies uneasily below the surface (as discussed by Mizzima). About 100 policemen were deployed to defuse the standoff, and the Chinese were arrested. About three weeks later, authorities in Burma’s Shan State seized about $128,000 worth of jade from Burmese traders who had purchased the lot from a Chinese dealer who had purchased it at last year’s special sale in June and July. The seizure took place due to the absence of a transport permit, the jade being bound for the border town of Jiegao, in China’s Yunnan Province. Ironically, Jiegao is a market for illegal cross-border trafficking, but the jade clearly was marked as having been acquired legally at the special sale. The seller had retained the transport permit in order to use it himself. Last Friday, The Irrawaddy looked at foragers for gems at the few sites in Mogok where such scavenging is allowed. Although usually only inferior quality material is salvaged, the return is enough to provide, in some cases, for generation after generation in a family. Pursuit of higher quality can even cause some family members to relocate from Mogok to Phakhant. 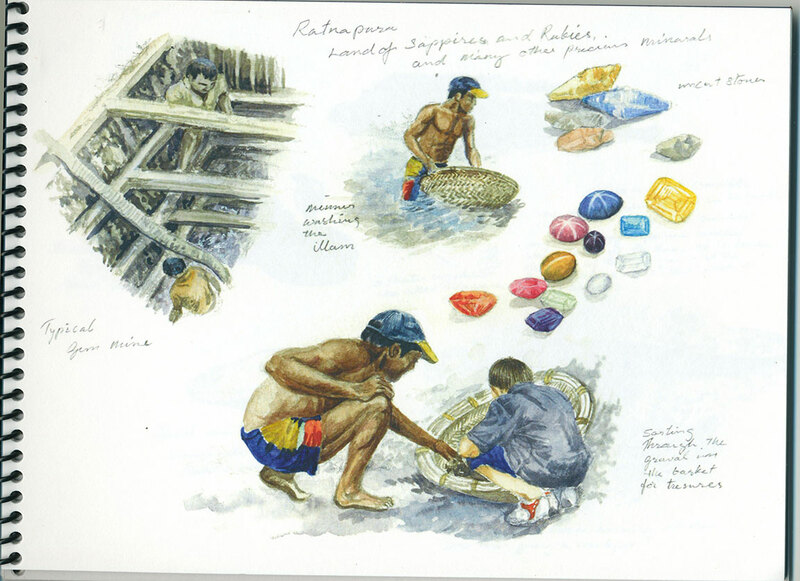 The fifth chapter of Martin Ehrmann’s memoir of gem trading in Burma is divided into two parts, as Ehrmann travels with his guest Dr. Vic Meen, curator of gems and minerals at the Royal Ontario Museum. First stop, in this installment, is to the Mogok stone tract. Next month, the two tour the jade lands of Mogaung, prior to its decline as an important trading center. In addition to “5.2” we’ll include the brief Chapter Six, in which Ehrmann takes a last visit to Mogok at about the time of Ne Win’s rise to power. To top it off, we’ll offer an earlier gem penned by Ehrmann as well. Chapter Five and Dr. Meen both get off to an auspicious start as he is invited to the home of Daw Than, an important mine owner, and one whom even Ehrmann had not had the privilege of dealing with. “My gem dealings with the women of Mogok were limited,” Ehrmann explained. “It was difficult to break in, as they have their own outlets and without difficulty sold all they wanted.” What has she to offer? Oh, just a 30-carat ruby. Next, Meen is introduced to a local broker who knows Ehrmann has a taste for the unusual—that being natural peridot crystals, which Meen had never seen from Burma, and which Ehrmann had seen only rarely. One crystal indeed was fit for a museum: 75 carats when cut. More success followed, and Meen was on a roll. 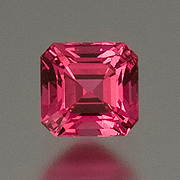 At the end of a very busy and profitable day, a miner brought them a spectacular spinel specimen. “The best minerals in the world have no particular home,” Ehrmann wrote. “They could come from the U.S., Canada, Africa, South America or from Burma. One thing is sure, you know it when you see it.” And, while Ehrmann saw this particular specimen in, say, the Smithsonian, Meek saw it a little further north. In the end, the specimen saw neither Toronto nor D.C. Perhaps in the thrill of the moment, Dr. Meek’s hitherto silver tongue slipped, with tragic consequences. In this edition of our newsletter we go nuts for neon, dippy for diplomas, tipsy for treasure, tweaky for tweeters, jazzy for JANY, and moist for Mogok. This month we feature an elegant suite of paraiba tourmaline from Mozambique. With its beautiful array of colors, it exhibits all the hues produced by this unique deposit in Nampula province, in western Mozambique. From purples to lavender, mints to evergreen, and teal to Caribbean blues, this neon color palette is unique to only three deposits on the planet where copper has entered the melt and produced theses fluorescent gems. 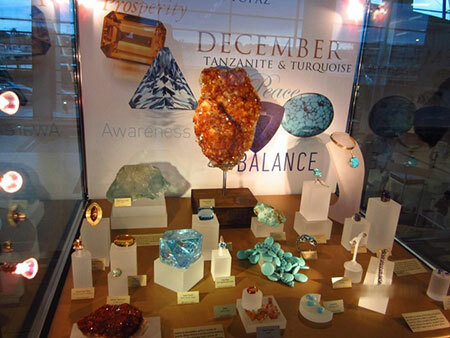 From the original find in Brazil, then across the Atlantic to Nigeria, and then finally across the African continent to Mozambique, paraiba tourmaline has mesmerized gem collectors world wide. The deposit in Mozambique is producing very little these days and seems to be on its last breath, making these stones increasingly rare. The demand for paraiba is still very strong in the market, and we cannot satisfy the appetite for many of our clients because there simply aren’t enough stones available. This progression of new finds and waning production seem to follow the natural punctuation of gem deposits—here and then gone—and so we hope you are left with one paraiba in your hand before the music stops. Interested? Call, or email us to inquire. 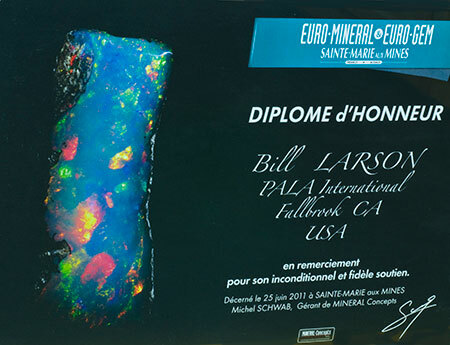 The diploma reads, “in thanks for his unconditional and faithful support,” and includes an specimen of opal, for which the show held a special exposition, Les Routes de L‘Opale. Editor’s Note: The following story about a unique inspection of temple treasure in India originally was to be relegated to a news brief, but details missing from sources like The New York Times were readily available from The Hindu and an in-depth India Today article (no longer available online), so we have assembled them here. The discovery of vast riches in Kerala, including many colored gemstones, has led to an examination of issues involving religion, culture, stewardship (and conservation), private property and the role the State. On the substance called man. Four years ago, an ascetic Brahmin devotee of a prominent temple in India’s southern Kerala state set in motion a legal matter involving the temple’s treasure—including perhaps thousands of jewels—that is now in the hands of the country’s Supreme Court. The petitioner, T. P. Sundara Rajan (aka Valia Swami, according to Wikipedia), is a former intelligence and police officer and, according to the July 18 India Today weekly, “a close confidant” of former Prime Minister Indira Gandhi. He also was enrolled as a Supreme Court attorney before quitting his practice and returning to his home—the home of Sree Padmanabhaswamy Temple, Kerala’s largest. T. P. Sundara Rajan speaks to reporters. 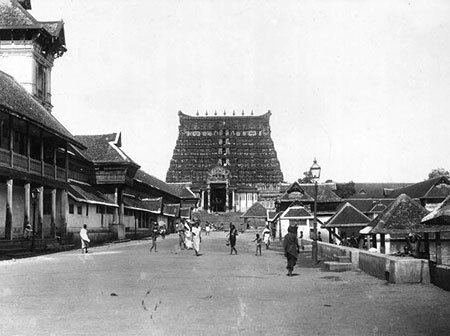 In 1997, per India Today, Sundara Rajan first became concerned that any treasure housed at the temple might be “siphoned off” by the erstwhile Travancore royals, who privately administer the temple under a 1951 exemption from the prevailing policy of public administration. While close to the family and its last maharaja, who died in 1991, Sundara Rajan became uneasy with later claims by the family of their ownership, rather than stewardship, of the riches. 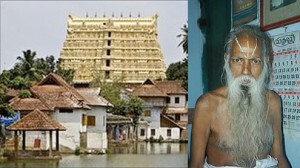 In 2007 he challenged the right of the family to administer the temple, followed by his 2009 petition in high court seeking government control of the shrine, which is recorded to have been built in the 10th century CE. The inventory process got off to an inauspicious start, as reported on June 27: Vault A was virtually empty, while Vault B held only some silver pots, but was believed to lead to another chamber. By July 1, however, The Hindu was employing terms like “treasure trove”—from vacant Vault A. The next day’s story talked of hundreds of kilos of gold, some of it from the 18th century, but also rubies, emeralds and Belgium diamonds. Coins came from Venice, Australia, Mysore and the East India Company. India Today mentioned 2,000 diamond-studded gold chains, with one weighing 10 kg. and 18 feet long. Navel-gazing. The above image, from an unofficial website, depicts Padmanabha (literally “lotus-navel”), the aspect of Vishnu reclining upon his many-headed eternal serpent-servant, Shesha (Ananta), with Brahma (seated on a lotus) emanating from the figure’s navel. (Click to enlarge) The temple’s main idol, 18 feet long, also assumes this posture. It is composed of 12,008 black ammonite fossils from Nepal’s Gandaki River, known as Saligrams for their association with Vishnu, covered with gold and precious stones. That same day, July 2, a foot-tall statue of Mahavishnu (literally “great Vishnu”) was found, and was thought to be a replica of the temple’s utsava vigraham (seated image of the presiding deity used in festivals). The unofficial website describes the idol as being encrusted with more than a thousand precious stones. Also found was the deity’s emerald-studded chest ornament, as well as two coconut shell replicas crafted of pure gold, one of which featured rubies, emeralds and other precious stones. (According to Wikipedia, coconut shells have a special place in legend and offering at the temple.) 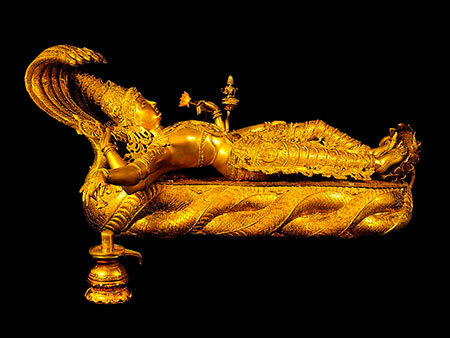 A July 3 story estimated the find at more than double the GDP of Kerala state ($22 billion per the New York Times), while the temple’s custodians complained at “putting a market price” on the treasure, which belongs to the deity. Begging to differ, as reported on the 5th, Marxist historian K. N. Panikkar declared that the “legacy of Kerala” belongs to the state and the public, and should be housed in a museum. He also opined that an inventory of the more valuable offerings might be found in the local archives or those of the maharaja, thereby revealing the sources of individual items. A separate article quoted prominent guru Sri Jayendra Saraswathi as saying the treasure was the “exclusive property” of the erstwhile royals, who had “dedicated their kingdom” to the deity, and who, over the years had themselves offered the treasure in obeisance. And no museum for Guruji (who was himself the center of a power-struggle scandal some years back): he feels the treasure should be kept where it is. That didn’t prevent the National Museum from assembling a blue-ribbon team for conservation study of the objects. Removing the material or even exposing it (as was done to reach it) can affect the aging process, as Museum administrator C. V. Ananda Bose told The Hindu. Eventually, security was tightened up top, and on the 6th, the Supreme Court ordered the cataloging in the cellars to be videotaped. On the 9th, The Hindu concluded, with the aid of scholars, that “[s]everal kings of the Travancore dynasty, from Anizhom Thirunal Marthanda Varma (regnal years 1729 to 1758 CE) to Chithira Thirunal Balarama Varma who passed away in 1991, would have contributed handsomely” to the temple treasure. But civic assets also would have been kept there because it was the safest location, according to former Kerala Chief Secretary Babu Paul. This same article listed new finds: three crowns studded with rubies, pearls and diamonds; hundreds of Roman gold and silver coins; and a solid gold statue of Krishna. In apparent agreement with Dr. Panikkar, it stated that researchers believed that royal records, inscribed on palm leaves in several languages, could hold the key to provenance. A listing of finds by India Today revealed that many objects are devotional, with some having use in particular festivals. Inspired by the treasure hunt, The Hindu combed its own coffers for a 1931 story about a three-hour December 6 visit to the vault, after more than two hours of forcing the doors when a key failed. In attendance that time, according to a story posted last week, were the Travancore Maharaja—and an ambulance. It seems that a 1901 visit had found the vault “infested with cobras,” as recounted by author Emily Gilchrist Hatch in her book, Travancore: A Guide Book for the Visitor (Oxford University Press, 1933). The 1931 visit likely was a consequence of economic downturn (fancy that), and taken from the vault were four chests, removed to the palace treasury for “counting and valuation.” Left behind where many coins, 300+ gold pots and a six-chambered chest of wood containing gemstones of emerald, ruby, diamond and more. While the visitors knew of at least four vaults at that time, they may not have been opened. According to the 1931 Hindu article, Hatch explained that wooden chests were placed in the temple to receive offerings; when they could hold no more, the contents were taken to the cellars. Tweet. See this streaming video of the only (surprise…) pair of matching singing bird pistols, attributed to Frères Rochat. At Christie’s. Reuters reported today that this month’s gems emporium brought proceeds “far lower than expected,” with €1.1 billion ($1.57 billion) in sales, according to a Federation of Chambers of Commerce and Industry official. The sale, held in the administrative capital, Nay Pyi Taw, concluded yesterday. 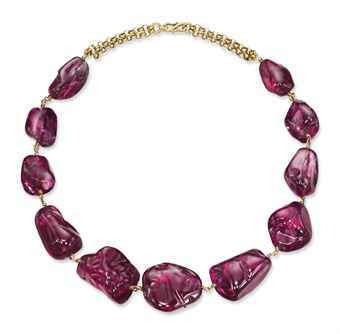 The sale offered 22,000 lots of jade, 282 lots of gemstones and 255 lots of pearls. Because quantity and quality were deemed to be better than in the past, the sale total was disappointing. Myanmar Times in a June 27 story called the previous sale, held in March, “almost unbelievable,” with a total in excess of €2 billion. Myanmar Times stated in another June 27 story that hotels were “fully booked,” and in its July 11 edition that nearly 4,000 traders—most of them Chinese—booked 1,633 rooms in hotels. The March sale attracted nearly 9,000 buyers. A July 13 story in The Irrawaddy used an individual jade sale gone bad in Mandalay as an illustration of resentment against Chinese influence in Burma. Myanmar Times painted a rosier portrait of the Mandalay gem market, in its July 4 edition, stating that the center draws up to 50,000 visitors a day, less than 100 of whom are foreigners. 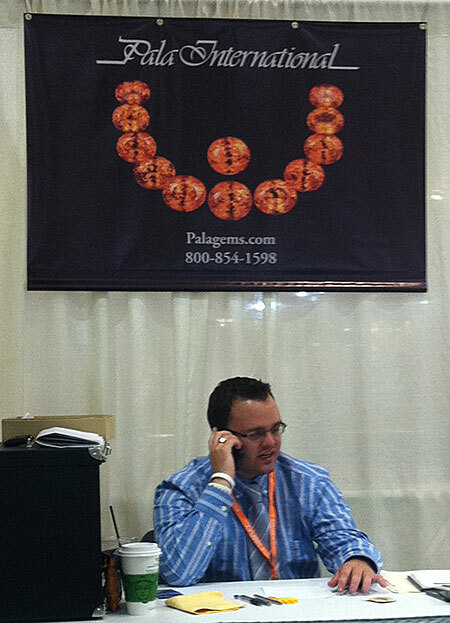 In an April 6, 2006, Palagems.com news item, we wrote that the now-disgraced Ralph Esmerian was “born into the business” of jewelry, being the son of above-mentioned Raphael, who was a third-generation jeweler. On his website, Richard Hughes quoted Christie’s as stating that Raphael Esmerian (1903–1976) was “the world's leading gem dealer of his time.” We noted that “Ralph Esmerian himself is known in the trade as a gem dealer’s gem dealer.” That was then. Exactly two years later, we reported that Christie’s had cancelled a $34-million sale on behalf of Esmerian, due to an appellate court decree. Superlatives about the collection being offered still abound in the sale notice, which is posted at Christie’s: “the most spectacular and comprehensive collection of period jewels from the 17th century through modern day”; “unparalleled to virtually any other in the world for its provenance, breadth, size and rarity.” At the time, Esmerian had filed for bankruptcy protection from creditor Merrill Lynch, which had loaned him the money to purchase Fred Leighton, with the collection as collateral. The protection effectively halted the sale. At 6:05 p.m., Christie’s auctioneer François Curiel made the awkward announcement. “It’s the first time you see me without my gavel,” he was quoted by Bloomberg. Fast-forward exactly three years. On April 15, 2011, Esmerian pleaded guilty to charges that he had offered and sometimes sold some of the collateral, without notifying the creditor. About a week from now, Esmerian is scheduled for sentencing. His collection—superb examples and details of which can be seen at Roskin Gem News Report and the blog The Jewelry Loupe—finally was scheduled to be offered for sale last month by New York’s Consultant Appraisal Service. It is with great sadness that we report the passing of our dear friend and fellow miner Rex Harris. 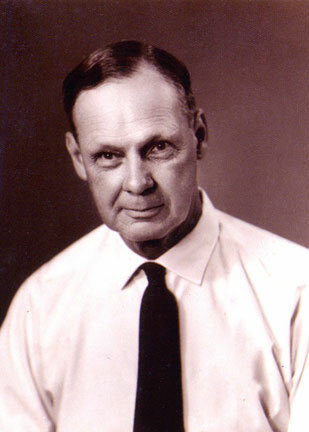 Rex was the miner of red beryls from Utah and was instrumental in bringing these beryls into the mainstream of the jewelry trade. He passed away on June 7th right after the JCK Las Vegas show—something he always enjoyed attending. 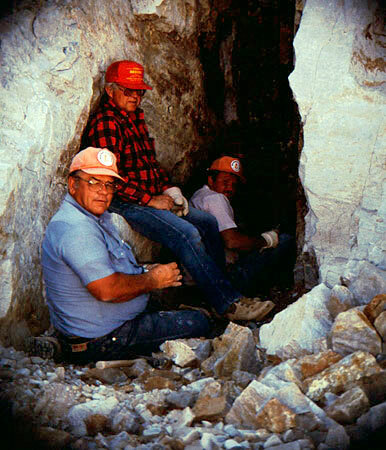 Rex Harris (left), Jerry Alkema and Gary Harris, red beryl miners. 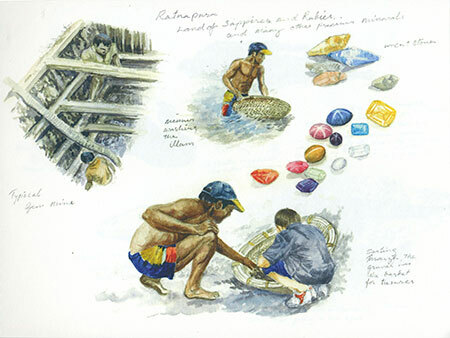 In this edition of our newsletter we delve into the realm of colored gemstones through our enchanting featured stone from Sri Lanka, and through the artwork of our neighbor from the same land; through the scrutiny by a professor and the inkling of a photographer; through sky-blue sapphire from Burma and delicate lilac spodumene from California. 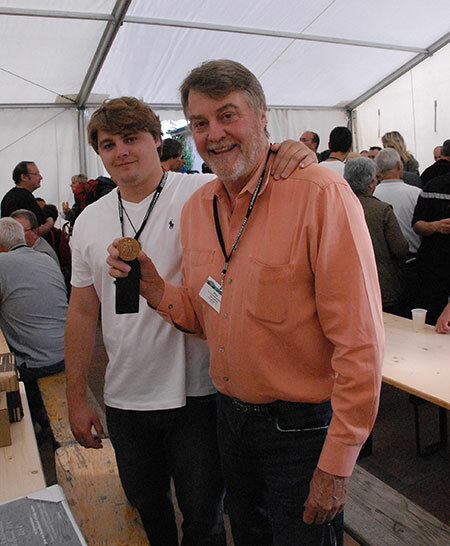 This year, Euro-Gem features the special exposition, Fascination Opale, which will include a lapidary craft workshop held by Jean-Pierre Gier and creations by several designers. 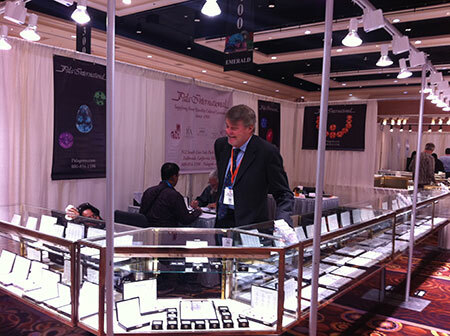 This month’s trade-only AGTA GemFair at the JCK Las Vegas Show received enthusiastic thumbs-up from Pala International staff. This was echoed by AGTA CEO Douglas Hucker, who reported “most exhibitors saying that their expectations had been surpassed.” So we asked Pala’s Gabrièl Mattice for a brief comment or two. 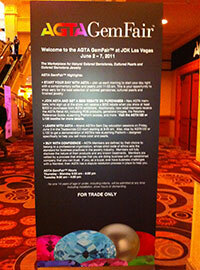 Along with a new year, came a new venue for the Las Vegas JCK/AGTA show. GemFair at Mandalay Bay is broken up into two rooms that keep the show from being overwhelming. The mood was up and so was business. We are very happy with the outcome of the show. There seemed to be the same optimistic attitude in the air as at Tucson, with lots of new first-time clients ready to buy. We often book appointments with clients to keep things running efficiently; no-shows can speak volumes regarding market health. But this year everyone kept their dates—and most came armed with a shopping list. 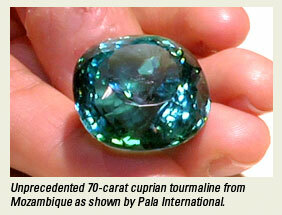 Once again, our Asian clients repeated the chants of Tucson in February: “Do you have any large bi-color tourmaline? Any large greens?” With the extension of the show by one day, there could have been a slump, but the busy-ness was continuous, right up through the last day. One can only judge how good a show really was by how busy the phones are afterward, and ours are ringing off the hook! All in all it was a great show, and I look forward to seeing you next month in New York! 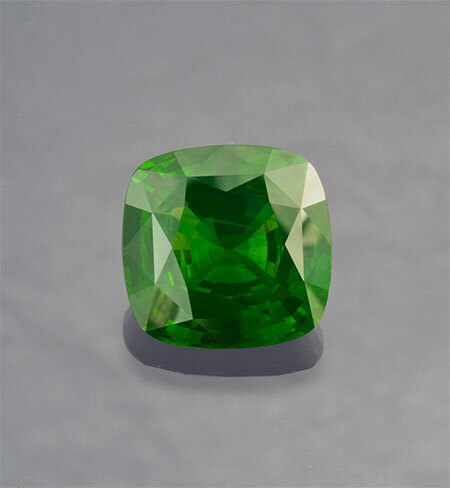 This month we feature an unusual green variety of zircon from Sri Lanka that glows with intensity. The substantial size of this zircon also adds to the rarity. 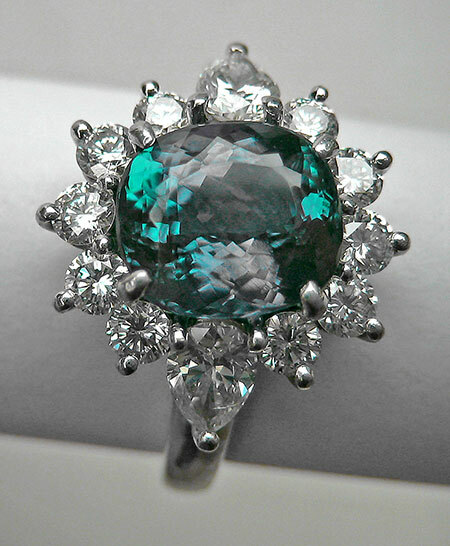 It features a luscious evergreen hue and a pleasing antique cushion cut. In zircon, a natural substitution of the element zirconium with uranium and thorium atoms causes damage to the crystal structure—known as metamictization—giving the material what some call a “sleepy” appearance as well as causing green coloring. 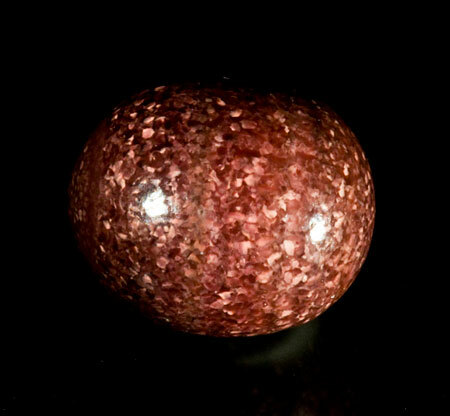 Zircon that has been affected by metamictization is known as “low zircon,” but we have only the highest regard for this month’s gem, which exhibits lovely clarity and color, and perhaps a “stifled yawn.” A rare, beautiful, and intriguing gem sure to attract your attention. The new material has been the subject of widespread concerns about its geographic origin and natural color. In fact, extensive studies of its composition, spectroscopy, physical appearance, and isotopic properties suggest that much of the red andesine on the market is the product of laboratory diffusion of copper into pale yellow andesine from Inner Mongolia. The study title is self-explanatory: “The Chinese Red Feldspar Controversy: Chronology of Research Through July 2009.” (Keep that thru-date in mind…) It’s included in the Spring 2011 edition of Gems & Gemology. 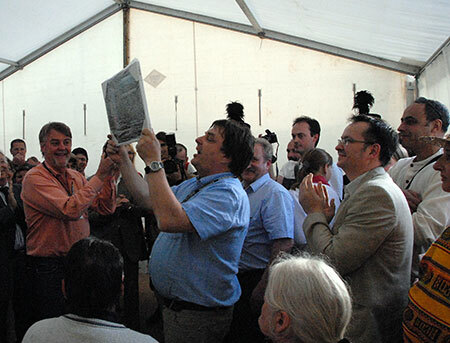 In 2006, the rumors began that some of the material was treated. Dr. Rossman’s analysis allowed a clear differentiation between the Oregon and Mexican samples, as illustrated on a ternary diagram; the Congolese, Tibetan and “Chinese” material overlapped in a clump. 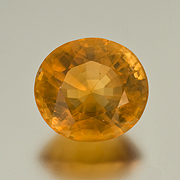 So one rumor—that Asian “sunstone” was actually treated Mexican yellow feldspar—was defused. But diffusion rumors continued, suggesting that introducing copper to pale material resulted in marketable product. Dr. Rossman reminds us to bear in mind that “Oregon sunstone is also most likely a product of diffusion—natural diffusion in the earth.” While the study continued, industry watchers noted on the one hand that “Chinese” andesine became wildly popular with television shopping channel shoppers, while on the other hand, treatment rumors went wild, too. One treatment—simple heating of yellow rough—theoretically might have produced red, but due to the absence of copper, replication failed in Dr. Rossman’s lab. These are but tidbits from a 15-page report that is a fascinating anatomy of the meeting between science, technology and trade. The conclusion drawn is the suggestion that much of the red andesine on the market is—as the rumors had it—the product of laboratory diffusion of copper into pale yellow andesine from Inner Mongolia. 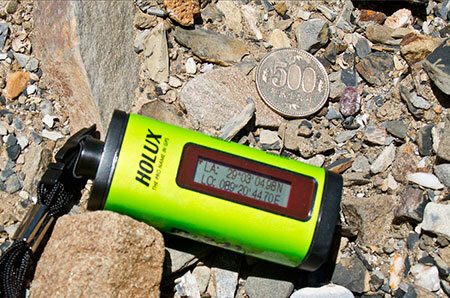 But, keep in mind the study time frame, which examined samples collected only through July 2009. 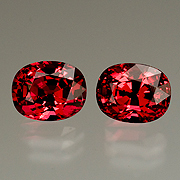 As our readers will recall, a 2010 field collection in Tibet turned up red andesine, which will require further study. Stay tuned for a follow-up report on that, in the next issue of Gems & Gemology. Susan M. Neider is a Princeton-schooled chemist and educator, a writer, and, as an award-winning photographer, it’s usually she who does the “taking.” A year ago January, however, it was she who was taken by the beauty of a 2.54-carat alexandrite in what appeared to be a genuine Tiffany & Co. setting. 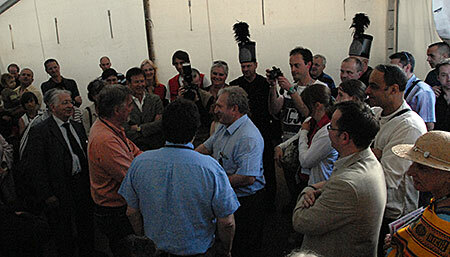 The ring was Neider’s with a handshake, but that’s when a bit of hand-wringing began. The original lab’s certification for the stone as being natural conflicted with a second opinion, which determined it to be synthetic. Neider helpfully takes you through the steps of what to do in such a situation. Fortunately, the original lab admitted the error, and the seller took back the ring. Lesson learned: Any lab, regardless of its stature, is capable of oversight. Remember, we’re all human. While multiple certs for identification alone certainly aren’t practical, if you have a strong hunch, act on it, especially when dealing with a major acquisition. Also remember that AGTA member-dealers (such as Pala International) are required to hold to a stringent set of standards. On May 18, Christie’s Geneva Magnificent Jewels saw a world record at auction for sapphire. A massive, 130.50-carat cushion-cut Burmese natural sapphire sold for over $7.1 million, more than five times the high end of the pre-sale estimate. Previous record, according to a press release, was a 42.48-carat cushion-cut Kashmir sapphire, sold in November of 2008, also by Christie’s Geneva. A world auction record also was set for a heart-shaped diamond of 56.15 carats. American Gem Trade Association’s periodic e-newsletter, ePrism, had a couple of items of interest (amongst others) in recent weeks. 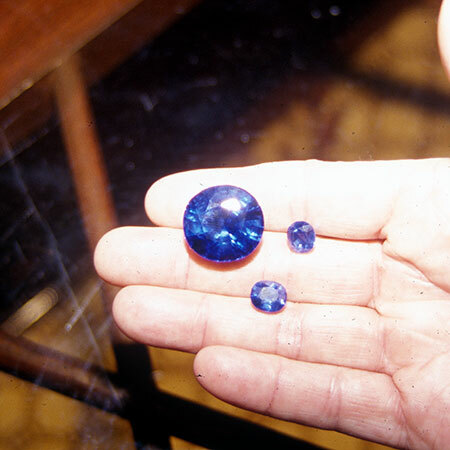 TanzaniteOne is know for, duh, its mining of tanzanite in northeastern Tanzania. On June 1, the company announced that it has optioned two sapphire mining leases in Australia, as part of the company’s diversification efforts. The Times (London) reported on June 13 about emerald mining in the Panjshir Valley of northern Afghanistan. The article quotes unnamed experts as stating that emeralds from this area already are sold for about $200 million a year, but the state receives no tax revenue due to smuggling of the rough to India and Pakistan. A properly managed industry could yield $1 billion, claimed an anonymous insider. The story is available at The Australian. Mizzima News reported a week ago that, according to a retired geologist, a new jade field was located in Kachin State’s famous Hpakant region. The geologist, Soe Thein, who did research in the area, said the find has been named “Jade Gaday Field.” High-tech means, described in the story, were used to locate the field. While the quality can’t be confirmed, the new location is near “Yadanar Gaday Gadar Field,” discovered 15 years ago. The latter field, owned by Asia World Company, is said by an anonymous source to have earned €50 million in profit last year alone. An undated Eleven Media Group story claimed that this year the find had an output of 0.3 (metric) tons of jade per acre. Meanwhile, the Kachin Independence Organization (which maintains a creaky truce with Burma’s rulers) cut the ribbon on a suspension bridge June 7 “built to provide smooth transportation to the jade mining area for civilians in Hpakant Jade Mining Township,” according to Kachin News Group. Days later, the KIO’s military wing was destroying bridges to stem the flow of government troops; clashes began with a relatively minor incident, according to the New York Times Wednesday, but tensions in the area are perennial. Fiscal Year 2010–11 figures for Burma jade production, held no surprises, as we reported last month. Nearly 47 million kilograms were produced, at least double that produced five of the last eight years, and nearly double FY 2009–10. Pearls also set a record for the last eight years, with 275,688 mommes being produced, nearly 50,000 mommes more than for FY 2009–10. Total gemstone production was sluggish at about 13 million carats, about two million over FY 2009–10, but well below the previous six years. See all the figures at our Burma Gem Sales and Statistics. The next gem emporium is scheduled for July 1–13, according to Myanmar Times (MT), in a May 30 story. It will be held in the Mani Yadana Jade Hall in Nay Pyi Taw’s Zabuthiri township. In a related MT story a week later, a warning came from jade dealers to beware of disreputable Chinese buyers who, in the past, have paid deposits on merchandise, only to “disappear afterward” never to be heard from again. This story stated that the July emporium “is likely to auction double the 20,000 lots available” at last March’s emporium. In the third of six installments, Martin Ehrmann is shown an array of gemstones in Bombay, the likes of which he’d never seen. 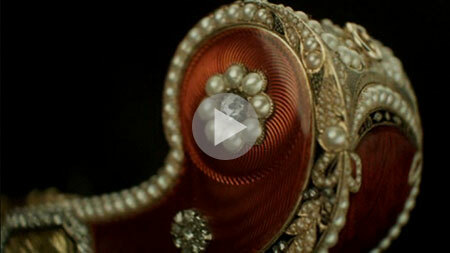 Sixty-carat emeralds, centuries-old jewelry, a huge pear-shaped diamond. But it’s a 52-carat sky-blue star sapphire that holds his interest, “excited when I could find something that would fit into one of my favorite museums.” Eager to see more, his visit is cut short when the authorities raid the offices he was to occupy. Oh well, off to Mogok, where he has more good fortune in the cutting of the 32-carat pigeon’s-egg sized star sapphire acquired in Chapter Two. 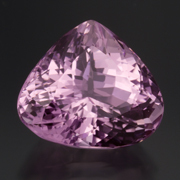 These crystals are extraordinary objects to the eye of the mineralogist; to see that spodumenes of characteristic form, as large as a man’s hand, but with bright luster and perfect transparency, and of the rich, delicate pink, amethystine tine, is a novel and unlooked for experience. Well, 106 year later, diamond, sapphire and even amethyst withstood the competition pretty well. But that’s a good thing for the discriminating gemstone buyer. 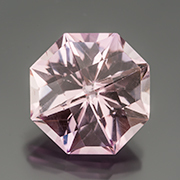 Kunzite is affordable and available in a range of saturations, with lovely, limpid examples offered in double-digit carat weights. This monochrome image from “Kunzite the Precious” is but a tease for the real-er thing, pictured below. Artist Gamini Ratnavira is a Fallbrook neighbor to Pala International. 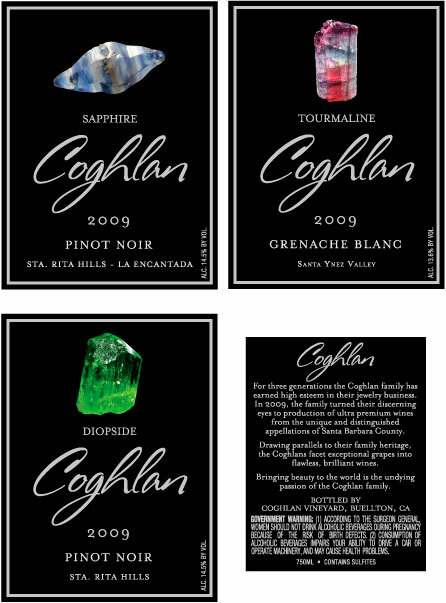 While he is well known for his paintings of tropical wildlife, we appreciate his renditions of mineral specimens as well. Yesterday we caught up with him regarding the latest in a series of “field sketchbooks.” These are brief, spiral-bound books, taken from his travels to places like Trinidad, Panama, Africa and the backyard—yes, one edition covers backyard birds of California. 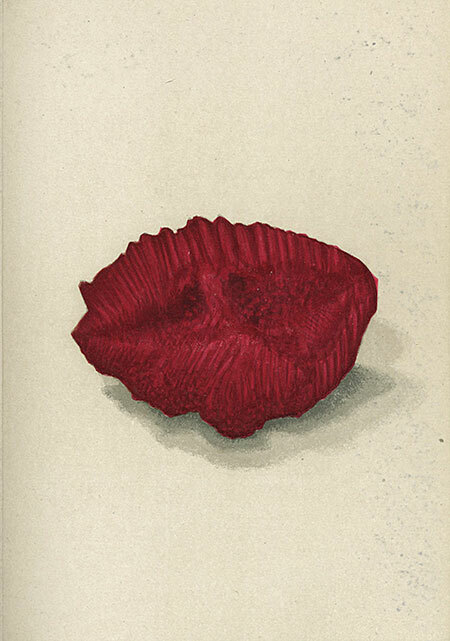 Forthcoming editions will be on Singapore and Peru. The latest sketchbook covers the artist’s homeland of Sri Lanka: its fauna and flora, archeological sites, traditional foods and fruit, and the culture of the country. The “sketches” actually are rendered in watercolor. The page above (click to enlarge) depicts a typical gem mine at left, with a miner washing the gem-bearing gravels, or illam. Gamini is steeped in gemstone lore, growing up in Ratnapura (“city of gems”). His surname, Ratnavira (“hero of gems”), pays homage to his descent from generations of fine jewelers; members of his caste were jewelers to the Kings and Queens of Sri Lanka. Gamini’s father, Sardha Ratnavira, was the first Asian to qualify at the Gemological Institute of America, in 1937–1938, when it was still in Los Angeles. His current project is an illustrated field guide to Sri Lankan birds and mammals. And it’s about time, Gamini told us. The last person to do so, W. W. A. Phillips, issued his Manual of the Mammals of Ceylon in 1935. 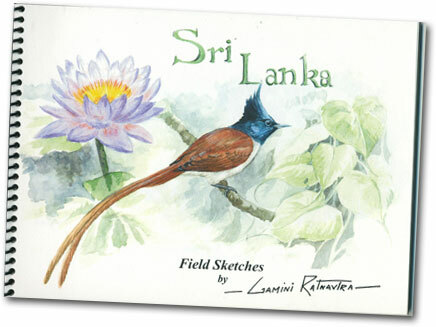 To obtain copies of the sketchbooks and more, contact information for Gamini Ratnavira is posted at GaminiRatnavira.com (cellphone is best). In this edition of our newsletter we feature a lion’s paw from Baja, some things new and old from Burma, and something celestial from Sarah. Continuing with last month’s theme of natural pearls we bring you another rare beauty from the sea—this time from the lion’s paw scallop. 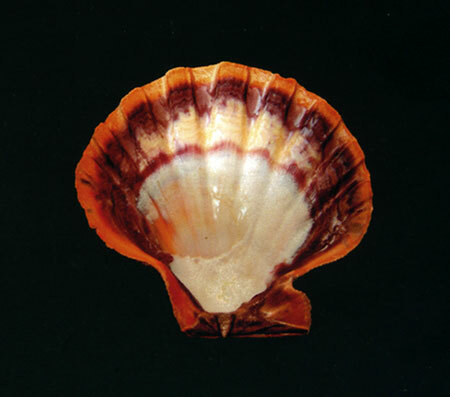 The fan-shaped mollusk from the Pectinidae family (species Nodipecten subnodosus), known locally off of Baja California as Mano de León, produces natural colored pearls from white to pink to intense purple. This month we feature a scallop pearl of the burgundy-colored variety, with a striking pixilated-type pattern. Random brushstrokes of white, pink and purple make for an almost 3-D effect when rotated in the sun. 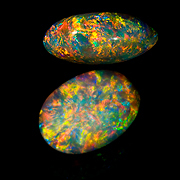 The light dances off these platelets of color like the pinfire effect in opal, or a miniature chatoyancy—definitely an interesting phenomenon. For more information on these pearls, see Scarratt, K. and Hänni, H. A., “Pearls from the Lion’s Paw Scallop,” Journal of Gemmology, Vol. 24 (2004), No. 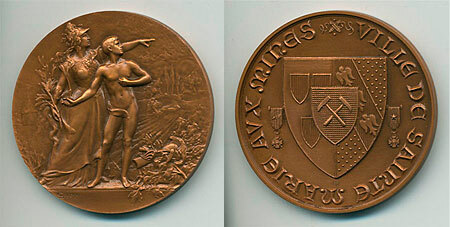 4, 193–203. An undated story by Eleven Media Group (EMG) noted that the fiscal year for 2010–2011 will set a record for Burma’s jade production. This matches statistics we have available via Burma’s Central Statistical Organization, which begin with FY 2003–2004. Jade production that year was 10,754 metric tons, peaking two years ago with 32,922 metric tons. FY 2010-2011 statistics for eleven months of jade production (Apr–Feb, the latest available) already total more than 40,433 metric tons, allowing the current fiscal year to break the record easily. Using the data reported by EMG, we are able to calculate a total for the eight fiscal years 1995–96 through 2002–03: 58,881,290 kilograms—or an average of 7,360,161 per fiscal year. This year’s production is five times that amount. While this past March’s gem emporium set a record, an April 27 story by Mizzima stated that bookings were sluggish for the 10th Sino–Burmese Border Trade Fair, which was scheduled to open April 29. Ten rooms were slated to display gems, according to the article. As we noted nearly a year ago, President Obama had yet to appoint his ambassador-level special envoy to Burma, a provision of the Tom Lantos Block Burma Jade Act of 2008. Indeed, a June 9, 2010 story in The Irrawaddy quoted State Department spokesman P. J. Crowley as stating, “The administration plans to fill this position soon.” A year later, Crowley is out and special envoy Derek Mitchell is in—subject to Senate confirmation. Read about Mitchell here and reaction from Burma here. Mizzima: Tay Za, president of Myanmar Gems and Jewelry Entrepreneurs’ Association, took time out from being Burma’s richest private citizen to do a rare interview with Rangoon’s The Future magazine. While stating that sanctions have had no impact on Burma’s jade market (thanks to China and loopholes), the billionaire pointed to the hypocrisy of allowing U.S. and French companies to continue natural gas projects in the country. Eleven Media Group: And how are those Chinese getting to Burma’s gem emporium? Direct flights from Guangzhou (Canton) to Nay Pyi Taw. Xinhua: Transportation staff in Burma will be taught English and Chinese to facilitate communication with foreign passengers. Myanmar Times (x2): A May 2 story warns that the March 24 earthquake in Shan State is just a “wakeup call” to developers of what’s to come. Two weeks later, a May 16 story reported that ninety percent of the buildings in the quake area were “not built using proper engineering designs,” according to a study in early April. 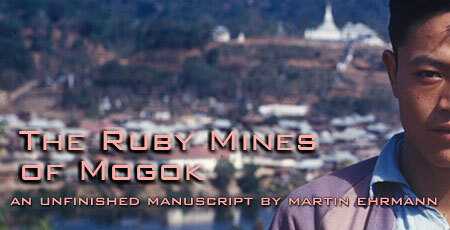 In the second of six installments, Martin Ehrmann returns to Burma, six months after his original trip in 1955, during which he visited not only Mogok, but also the area controlled by insurgents ten miles away. Ehrmann learned much regarding the etiquette of bargaining in Burma, but it didn’t prevent him from slipping up, as he recounts in Chapter Two—risking consequences that might have ended his dealings in Kyatpyin and beyond. Also in Chapter Two, Ehrmann recalls an evening with A. C. D. Pain. Over a good meal and strong cider, Pain regaled his visitor with local lore and history. Although Pain rebuffed Ehrmann’s attempts to buy Pain’s 250-gem collection, other collectors, such as U Maung Sein, while somewhat hesitant, accepted Ehrmann’s offers. Like God the Father’s globe on both His hands…. Even though Browning’s imaginary bishop never lived (let alone died), the poet’s inspiration could have come from the real world. Thus Searight told her interviewer that she searched national galleries for such a depiction of Our Lady, while keeping an eye out for the tomb in Rome as well—given the detail of the bishop’s blueprint, which called for “antique-black” basalt, “peach-blossom marble,” a bas-relief in bronze, and jasper “pure green as a pistachio nut.” Neither vein nor vault was found. But in her travels as a journalist, lecturer and historian (her books include The British in the Middle East, Steaming East and Yemen: Land and People), Searight kept coming across lapis. 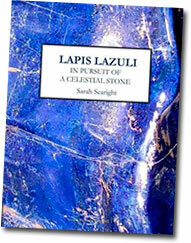 A description from the publisher of her new book, Lapis Lazuli: In Pursuit of a Celestial Stone, follows. 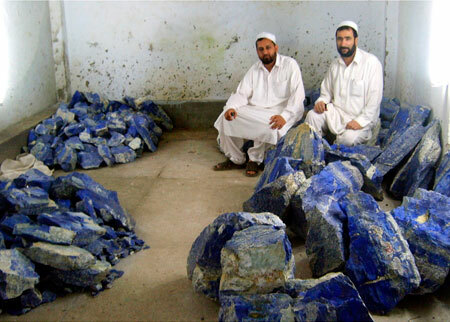 In this book Sarah Searight seeks out the history of the stone across many cultures, traversing a wide geographical area from the lapis mines in the mountains of north-eastern Afghanistan. She travels to the Middle East and Central Asia, to Saharan Africa and on into Europe. 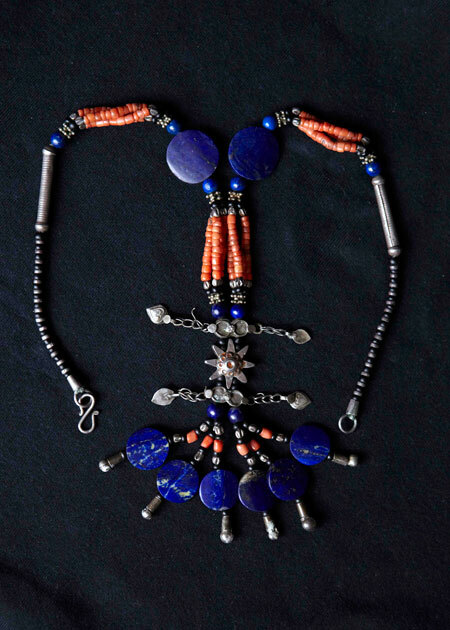 On the way she examines the different perceptions and roles of lapis both as stone and—just as important—as pigment. 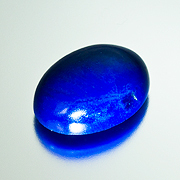 That brilliant blue on the sacred paintings of Buddhism and Christianity—on the walls of caves and churches, in illuminated manuscripts, on Renaissance Madonnas—was produced from lapis lazuli. 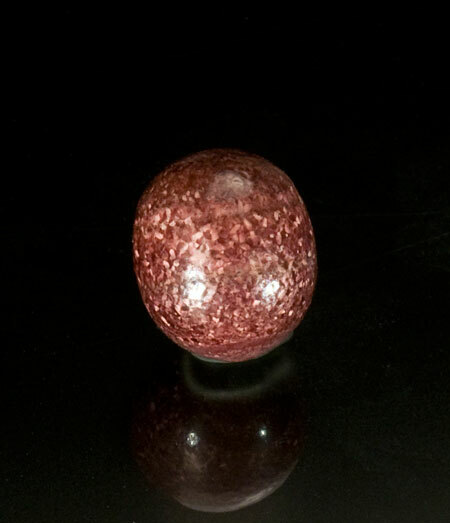 She takes us into both remote and familiar worlds where this remarkable stone cast its spell to represent different meanings to different societies, nearly always with an an enduring sacred dimension. Royalty laid claim to it as “royal blue” but artists’ patrons insisted on Madonnas being painted in sacred blue. The common theme has been the rarity and inaccessibility of the stone, the purity of its colour and its perennial association with the heavens. The book can be purchased through the author’s website and other sources.